Since I was looking for a good read, and I am always trying to improve my auditioning skills- I decided to give it a go. Some of these guideposts included conversations between Michael Shurtleff and actors/actresses he has coached. They discuss the character the actor/actress is portraying, their relationship with the other character is the scene, and how they are portraying the emotions the character is feeling. At first, I began to feel like these conversations were a bit repetitive and pointless. However, soon the topics the actors were struggling with began to hit home. It was helpful to hear the actors (so to speak) describe the struggles they were dealing with in a scene, be able to relate to those struggles, and read Michael Shurtleff’s solution for those struggles. This book has given me a whole new way of thinking. I know I will be reviewing the many useful tips in this book before my next audition. Some of the things I read in this book I have heard/read before. Some of the things were a first to read. Either way, it was helpful to remind myself of the things I may have forgotten, and learn some new things! I would recommend this book to any actor. It is definitely something every beginning actor should read. 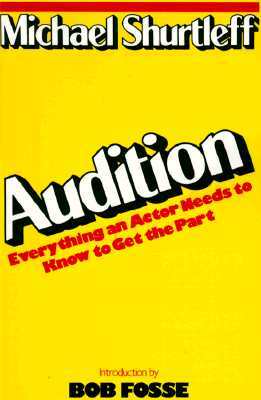 It is a wonderful guide as to what a beginning actor can expect at an audition and covers such topics as: who the auditors are, entering and exiting an audition, your wardrobe, standing in the light, and working on the sides. As an experienced actor, I also found it very helpful. Some of the things I found helpful were- advice on marketing yourself as an actor, putting yourself into a reading, and thinking beyond what is stated in the script. I think every actor, no matter what level or stage of their career, would benefit from having this book in their tool belt. I highly recommend at least going to this LINK, and checking out the preview pages offered by Amazon. Enjoy! I just want to second you on this. This book is one of the ABSOLUTELY MUST READS. As an actor, you’ve just got have this in your arsenal. Such good tips. You’ll go into your next cold read with so much more clarity. This is the book I got when I was 14 and has stayed on my bookshelf ever since. MUST READ and RE-READ!